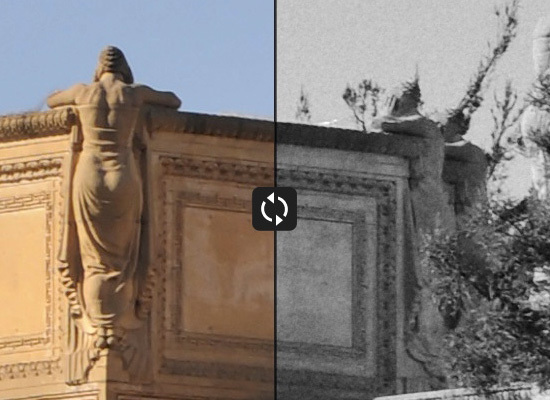 The French software company DxO worked on an update to its FilmPack emulsion emulator while updating Optics Pro to v6.6 but the new FilmPack 3 stands on its own. Literally. 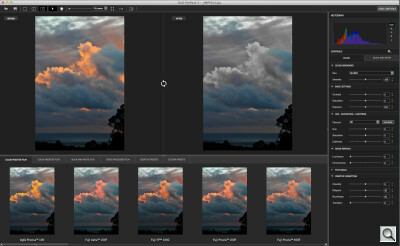 Like FilmPack 2, it functions as either a standalone application, within Optics Pro or as a Photoshop plug-in, but FilmPack 3 adds support for Lightroom and Aperture. 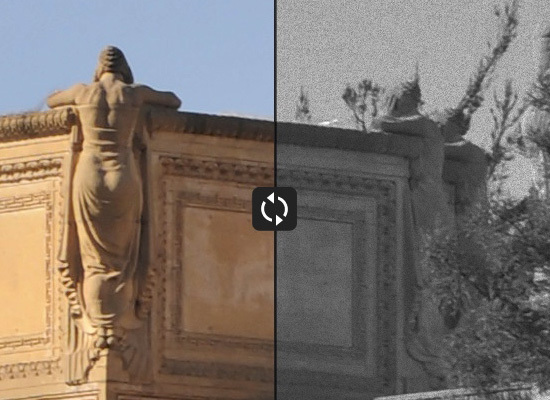 FilmPack 3 includes a few new tools as well, including: Customized film effects, Hue/Saturation/Lightness sliders, a Channel Mixer, Creative Vignetting and a Noise Removal tool. That wasn't all that DxO was coding, though. The company revised a number of the emulsion renderings and added 10 more while updating the user interface. FilmPack 3 is a healthy upgrade from FilmPack 2. And how they did it is interesting. They shot the film and had it processed in leading labs both in New York and Paris -- Picto in Paris and Duggal in New York -- before analyzing the results to build the renderings. 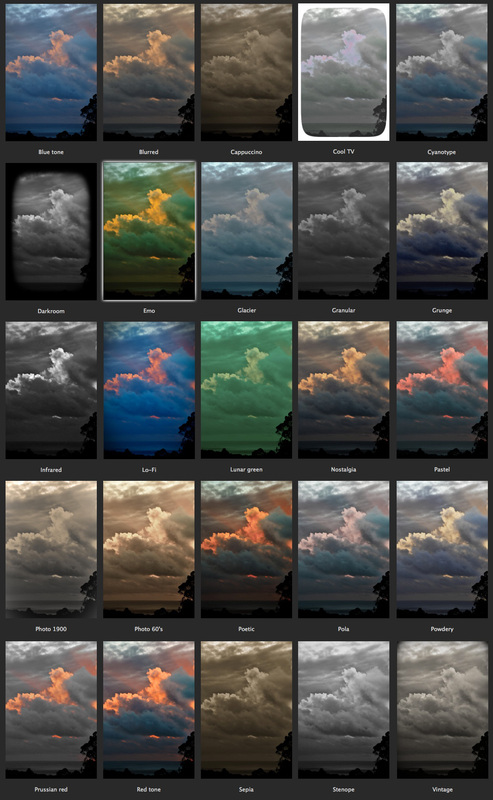 The full list of 60 emulsion renderings includes four categories (not counting a Custom Preset category of settings you can save derived from variations of the standards). 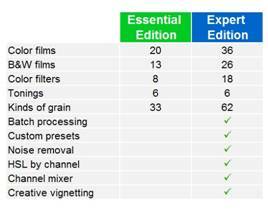 The four categories are, as you might expect, Color Positive Film, Color Negative Film, Black and White Film, and Cross Processed Film. The user interface includes a number of controls you can fiddle with to fine tune the effect or even radically alter it. At the top is a histogram, which you can configure to display all the RGB channels at once or individually. You can also display just the Luminance channel. There are both Color and Black and White Control panels. You can save your settings as a preset from the little gear icon menu. As a standalone application, you merely have to launch FilmPack 3 and open a JPEG image. FilmPack 3 is built into Optics Pro, so you can access it from the menu system while working on an image. 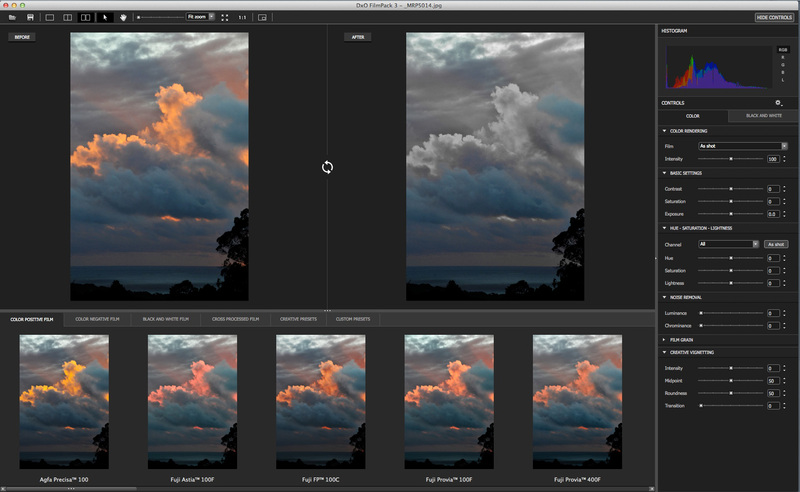 In Photoshop, Lightroom or Aperture, you open an image first and then call FilmPack 3 to edit it. However you've launched FilmPack 3, the interface is the same. If you elect to Hide the controls, you can just sample the various options displayed in the filmstrip at the bottom of the screen. Which, you know, is kind of fun. And certainly beats the pantaloons off buying rolls of the stuff to see what it looks like. Or you can show the controls, pick a rendering and fine tune it with sliders. If you want to save the result for another day, you can save it as a preset. Which is a bit like creating your own film. But it only takes a second to realize how powerful it is, too. 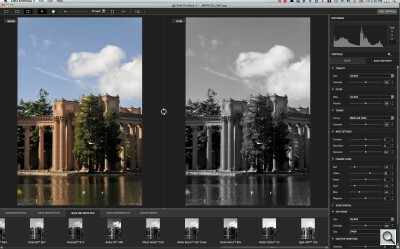 You can, for example, remove noise before you apply grain, improving the results. And, despite DxO's exhaustive efforts to eliminate it in Optics Pro, you can now add vignetting to your image, too. There are several view options, as well. A single image view which you can toggle, a split image view and a double image view. You can change the magnification and use the Hand tool to move around the image, which you can quickly take to full screen or 100 percent views. There's also a navigator window you can drag around the image. A 100 percent view is particularly interesting in FilmPack 3 because it shows you the distinctive grain patterns of the various emulsions. The renderings are, in fact, quite detailed as our rollovers below show. DxO told us the company was surprised to find FilmPack devotees like the program for "its creative capability." After a few minutes with it, we could see why. Film is the grandfather of all presets. Film has, if nothing else, personality. And by rendering a pristine digital image in the contrast, saturation, color and grain characteristics of one emulsion or another, you quickly get a different look, a different feel. We asked Tom Abbott, a former Kodak research scientist, to sit down with us and informally review the Kodak emulsions for their color fidelity and grain characteristics. Particularly interesting to us was his impression of the relative difference between the Kodak emulsions. Frankly, it's impossible to test this sort of thing. We thought of taking digital shots of our local Kodachromes but outdoor shots from years ago are impossible to replicate accurately. DxO told us they do get feedback from photographers that feel one or another emulsion should be tweaked one way or another. But the advice is often contradictory. And, as Tom put, perception is all in the mind. The results of our half-hour emulsion review? He was impressed, confirming the various renderings accurately portrayed the emulsions, including the color shifts in Kodachrome. Kodak got away with that, he observed, because it wasn't widely appreciated. As he was involved in the development of some Kodak emulsions (notable its instant film), that was a better evaluation than we alone might give. But it's easy to make too much of the accuracy of the renderings. There's no real need to match an emulsion as much as to evoke one. And they do, as Tom confirmed, evoke the character of the emulsions they simulate. We've put together a few rollovers to illustrate each major category in FilmPack 3. They are not comprehensive, just a few examples at 100 percent to see how the renderings alter the original. The image is left in its original state on the left and rendered with the indicated emulsion on the right. There's a good deal of sky and textured concrete to show off color shifts, saturation, tonality and grain. Compatible with Mac and Windows, DxO FilmPack 3 is available in two editions, Essential and Expert, which differ in terms of available film renderings and features. 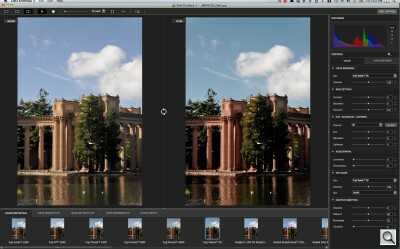 A free 31-day trial version of DxO FilmPack 3 is available on DxO Labs' Web site to test it on your own pictures. Having spent no little energy and no small fortune escaping the clutches of film technology, it may seem odd to return to it for what are essentially it's limitations. Love is blind, but as technicians and craftsmen, we're supposed to have standards. But it isn't nostalgia that makes FilmPack 3 compelling. It's the variety of different renderings, interesting even if you've never shot a roll of film or fell in love with Tri-X. They're presets by any other name. And those defects? The grain in high ISO emulsions? The color shifts? These days they distinguish a look, a style from the vanilla digital capture. They're most often used, it's true, to mask low resolution, poor quality cell phone cameras. But why should the kids have all the fun? And fun it is. Which is no small thing these days. Wheith the November 2011 release of v3.1, FilmPack renewed its lease on life, broadening its appeal to a generation of photographers who think of film as ... well, who don't think of film at all. But we do think of presets. And filters. Cool filters. That transform our ordinary smartphone photos or digicam captures into radioactive apparitions, noir forebodings, nostalgic imperfections and other stylistic charms. Some of us even display the discipline to adopt one of such as a personal style for everything on our blog. While others of us display our virtuosity by finding a use for everything we like. This trend was not lost on DxO, which had soberly confined itself to strictly emulating emulsions in previous versions of FilmPack. We found that fun, frankly. Consider the option for the curious photographer who wants to compare effects. Buy a box of Velvia and another of Kodachrome (as if) or any other pair of emulsions, then spend an afternoon shooting one and another shooting the other. Wait a few days for the slides to come back (or a few hours at the pro lab if it's still in business). Project them on a beaded screen, trying to compare them with just one projector. Rather than all that, we could just click on one effect or click on the other. We could see our color shot in Plus-X black and white or just as easily as a Polaroid. It was fun to change films with nothing more than a click. Fun but not terribly instructive. Not really inspiring. Nothing appeared on the screen that made us want to shoot Plus-X again. Or regret the loss of Kodachrome (sorry but no). Which threatened to turn FilmPack into a curiosity. An afternoon's diversion despite its accuracy in mimicking emulsions of the past. 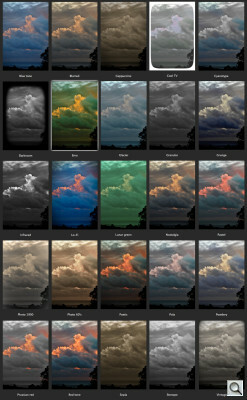 A collection of 25 "Creative Renderings," otherwise known as presets. Among them are vintage effects, color nuances, sepia variations, partial desaturation, all intending "real emotional impact." All of which you can tweak yourself for a unique rendering. But what good are unique renderings without an import option (and what good is that without an export option, we had to wonder) so you can share them and make a name for yourself? So that's more or less in there too. DxO made the filmstrip preview resizeable so you can enlarge it a bit to better evaluate the effect (where you couldn't really see the effects of say, grain, before). And it added a full-screen mode, too. 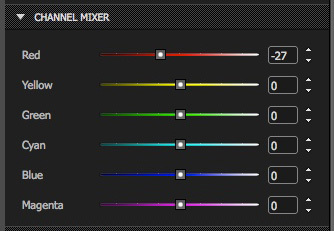 And the powerful channel mixer gets color sliders, making it easier to use. So we gave the Expert edition (with all the tinkles and toots) a try. Interface Issues. We had a little trouble with the stand-alone version. Whenever we visited the Preferences dialog, all the menu commands were disabled. We had to Quit from the Dock. So we gave the Photoshop plug-in a shot. But the plug-in only runs in 32-bit mode. Grumble. Back to the stand-alone version. Avoiding the Preferences. Joining the original five tabs along the bottom of the screen is the new Creative Presets tab. Before we dug into it, though, we grabbed the divider and pulled it up to make the preview area a third of the screen. That limited the view to five presets at a time, but they were much larger. A nice enhancement. Beyond Film. Next we toured the Presets. Here's the list: Blue tone, Blurred, Cappuccino, Cool TV (with a TV mask), Cyanotype, Darkroom, Emo, Clacier, Granular, Grunge, Infrared, Low-Fi, Lunar green, Nostalgia, Pastel, Photo 1900, Photo 60's [sic], Poetic, Pola, Powdery, Prussian red, Red tone, Sepia, Stenope and Vintage. But what's in a name? Scrolling was odd, seeming to go left when it was actually going right. Just a redraw phenomenon, we suspect. But using the elevator bar was not successful. We grabbed, it resisted. But only when it was in the far left position. It worked normally from other locations. So we used the arrows to step along, getting the odd jumping effect. We did notice a few other interface improvements, though. Open and Save buttons are now in the stand-alone version. Large as we made the previews, you still can't tell what the grain pattern looks like, of course. But applying any one of them for a closer look just takes a click, so it isn't a big deal. Actually, 3.1 shows the effect of a preset when you rollover it, according to DxO but that didn't work for us in the OS X version. We liked the Darkroom effect, which turned the image into a black and white and framed it in a dark vignette. But we felt the vignette was a bit too blatant. So we raised the Intensity slider in the Creative Vignetting panel to lighten it up a bit and raised the Roundness slider to make it less boxy. That was just what we wanted. Very subtle. Export. 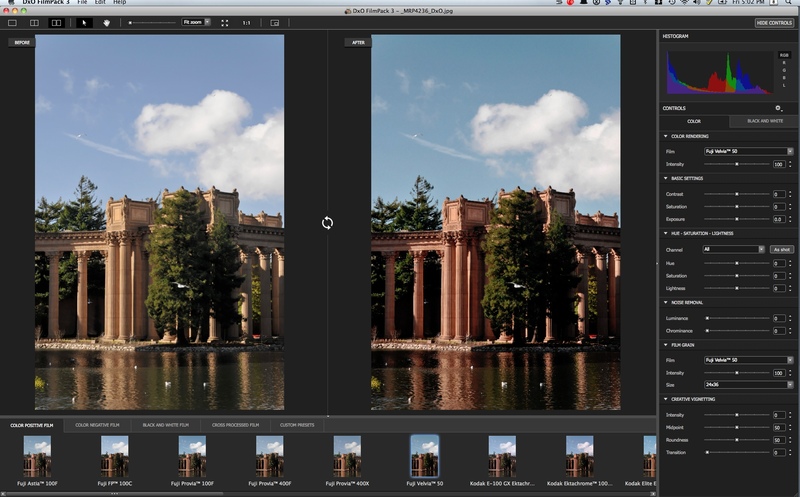 We liked it so much we thought of emailing DxO to have them add it to Creative Presets. Then we remembered we could create our own in the old Custom Presets tab. So we did. Once we had saved Uncle Vignie as a Custom Preset. But we couldn't export it. Hmmm. We tried to look up "export" in the documentation but the new documentation isn't online yet. So apparently, you can only Import presets. No, wait, hang on a second. The presets are already exported. You just have to find them. On Mac OS, they're in the ~/Documents/DxO FilmPack 3/presets folder. We found Uncle Vignie there, duplicated it to the Desktop, renamed it Aunt Virgie and successfully imported it. We also peeked inside it with a text editor only to find XML for the settings like <Param value="-37" name="ArtisticVignettingCornerAttenuationB_W"/> among others. Still an Export option to copy the file to some other location (perhaps for emailing) would have been a nice user interface improvement. DxO said it also plans to provide packs of presets for "special events." Conclusion. Apart from the hiccups mentioned above, the experience of playing with the new v3.1 presets was a pleasure. We hope they help FilmPack 3 find a new audience because this unique tool remains one of our favorites. And not just because we can tell Plus-X from Tri-X.